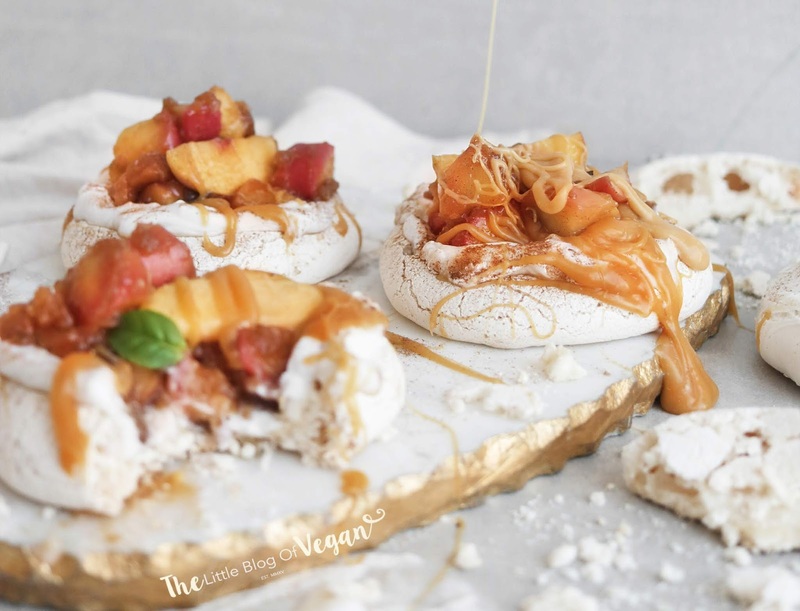 Light, crisp, melt in the mouth egg-free meringue nests, topped with a homemade apple pie filling, caramel sauce, grilled peaches and a dusting of ground cinnamon. 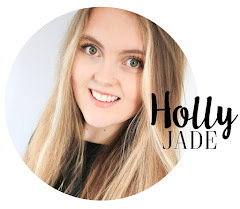 Perfect for Autumn/Fall time! 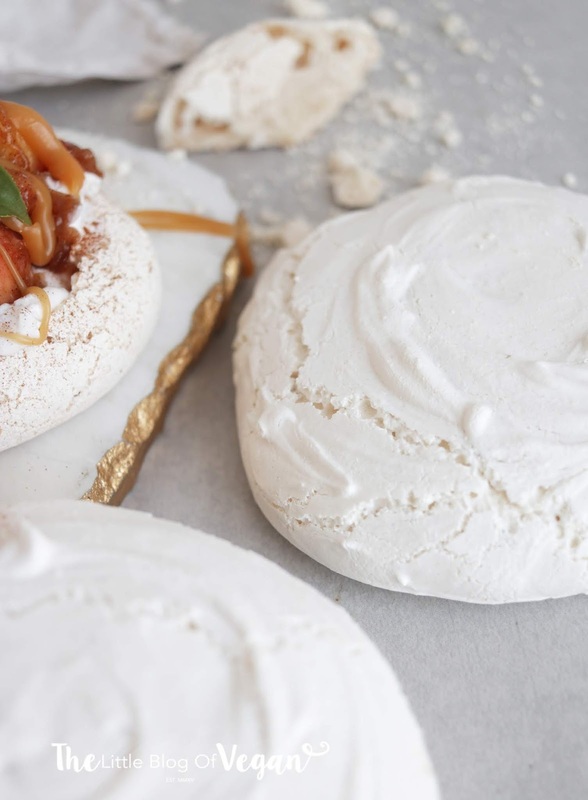 The meringues are easy to make, containing only a few 'easy to find' ingredients. 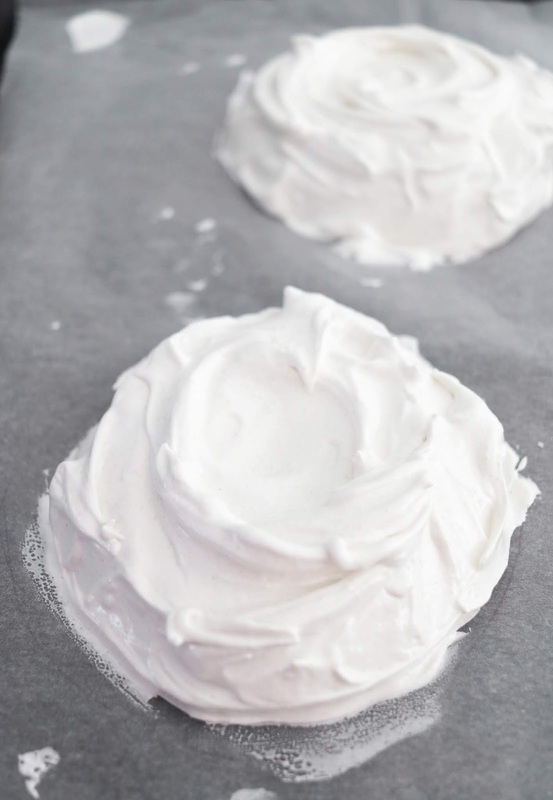 I used aquafaba, which is the brine from a can of chickpeas to help make the meringue. 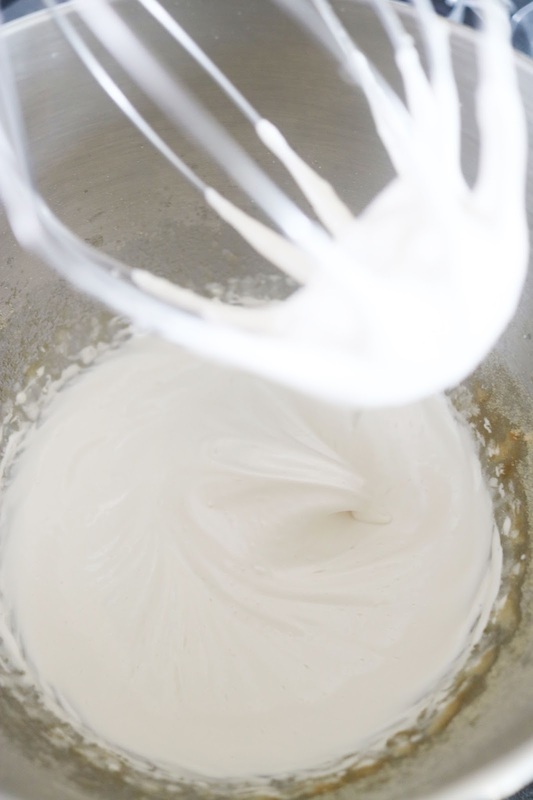 It turns out just like meringue...because it is- haha! 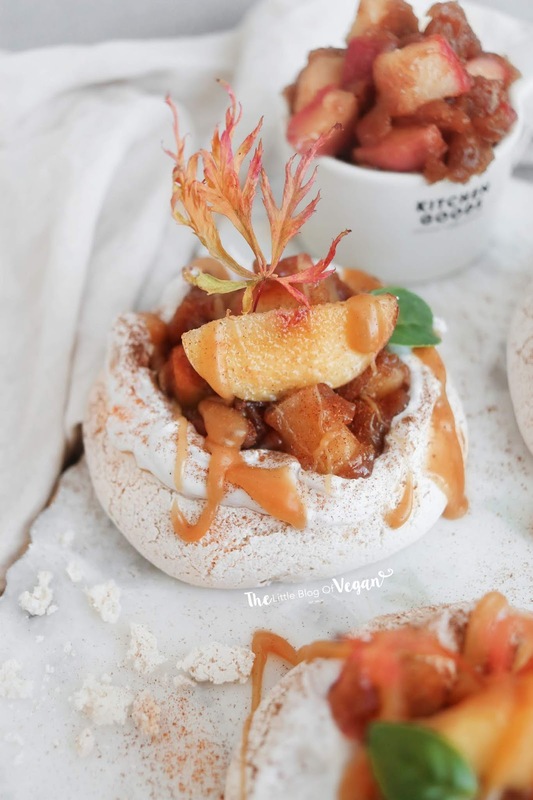 I've been loving all of the Autumnal spices including ginger, cinnamon, nutmeg etc.. and I was really excited to combine meringue with hearty & cosy cinnamon apple pie filling. 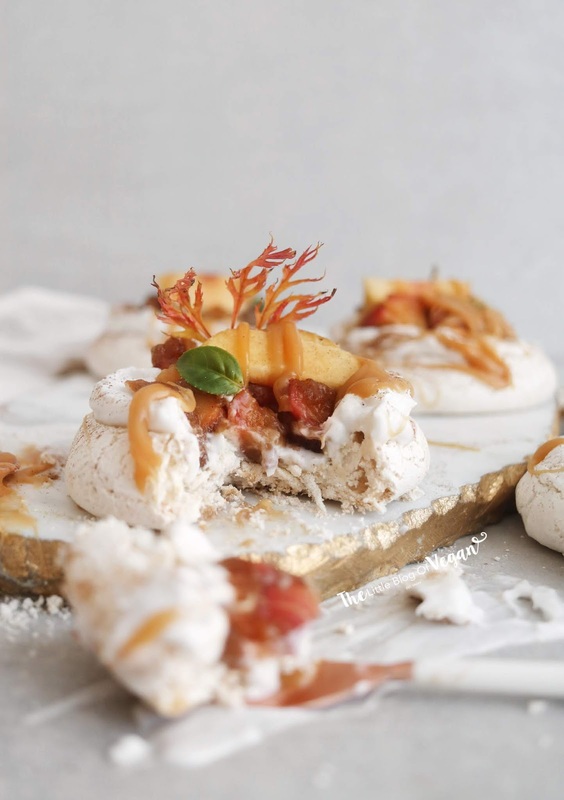 For added sweetness, I drizzled over caramel sauce which compliments the spicy apples- YUM! I am over the moon to show you my brand new and extremely beautiful oven. 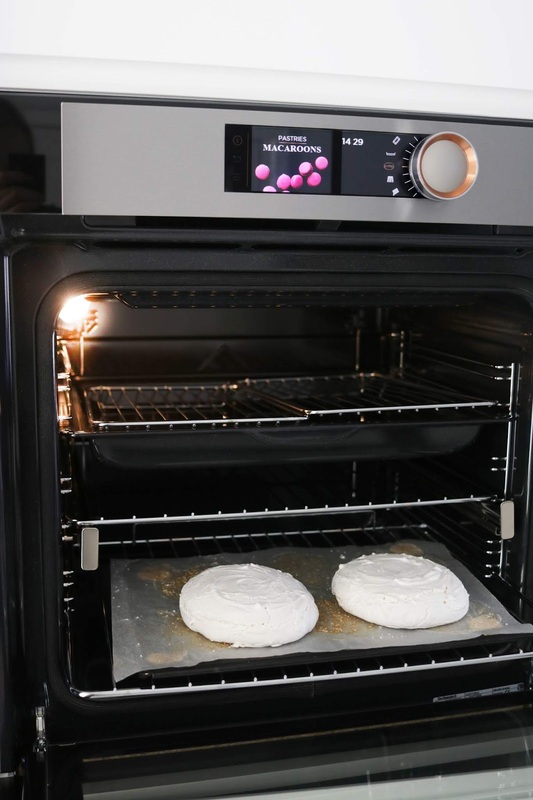 It's from DeDietrich, and is basically the Tesla of oven's- it's insane! I got the rose gold & black, which is fitted into my kitchen unit. 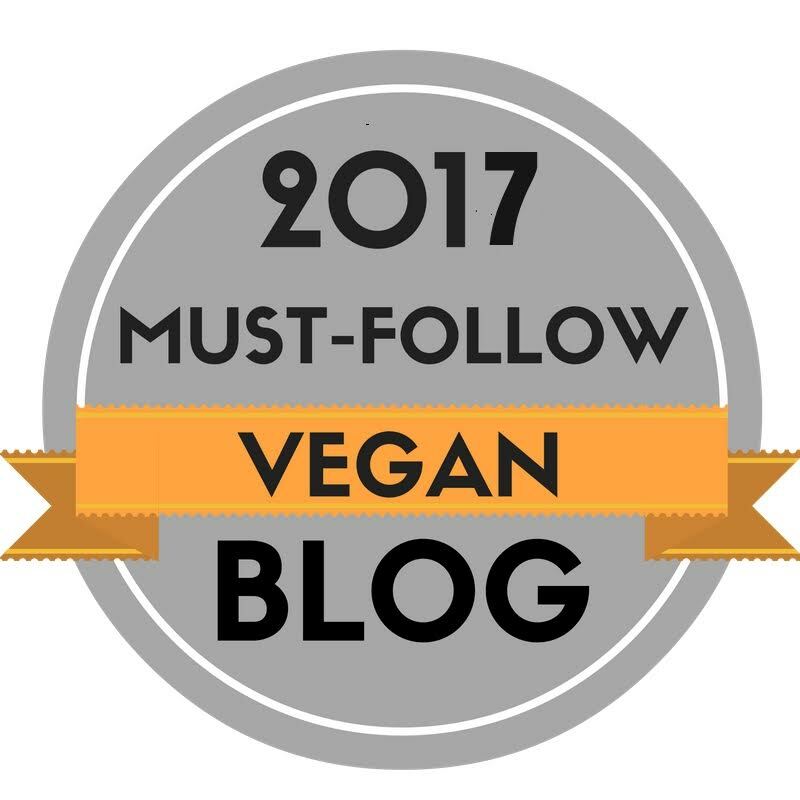 Check out their range of ovens here, perfect for any baker- I personally highly recommend! Step 1- Preheat your oven to 120 degrees c and line a baking tray with greaseproof paper. 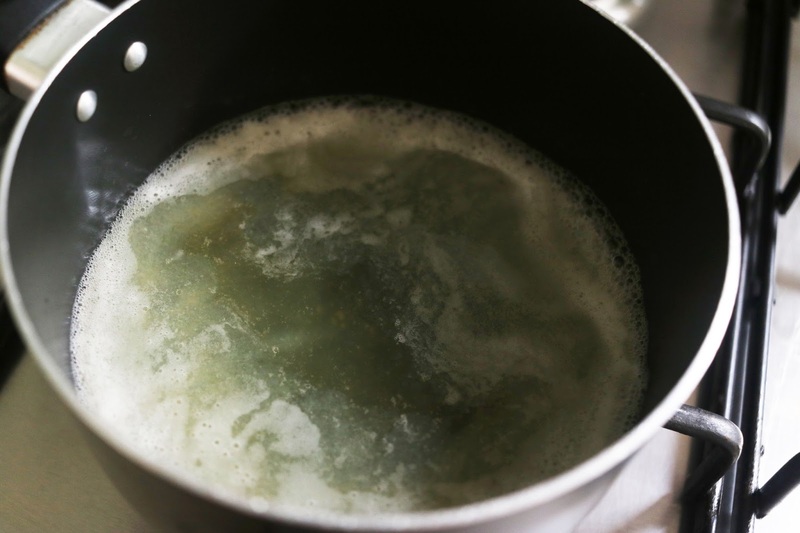 Step 2- Drain the brine from a can of chickpeas and place the brine into a small saucepan on the hob over a medium heat. 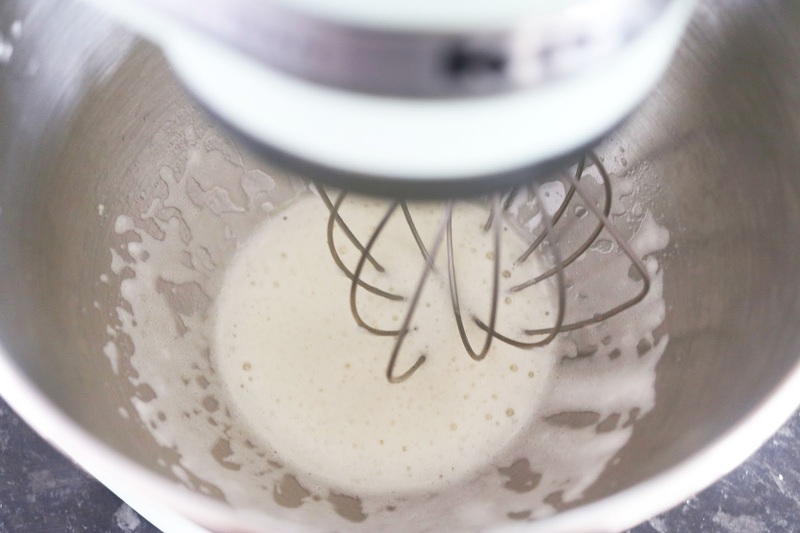 Step 3- Place the chickpea brine into a mixing bowl and whizz up on high until fluffy, then add in the cream of tartar. 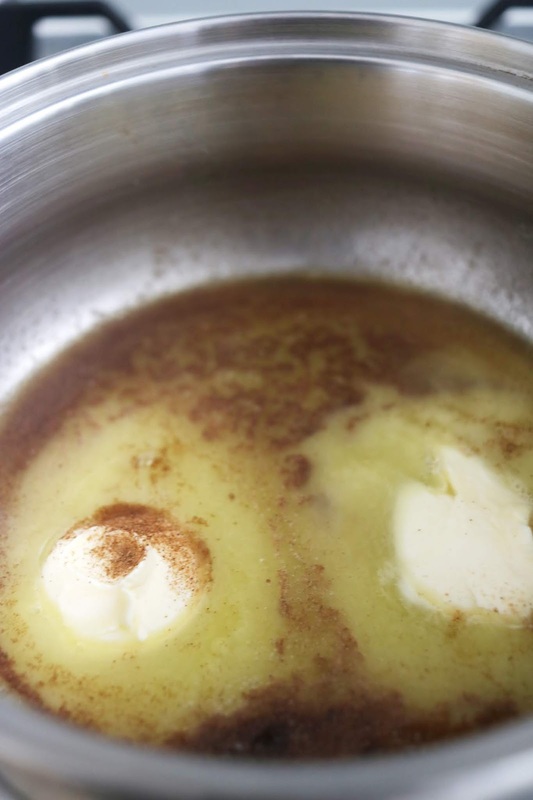 Step 4- Once fluffy, add in the golden caster sugar & salt a little at a time while the mixture is still mixing on high. Step 5- Dollop small mounds of the meringue on the baking paper, creating a crater by making the sides a little higher than the middle (as in the photos below). Step 6- Place into the oven and bake for 1 hour, then turn off the heat and allow the pavlova to cool completely in the oven. 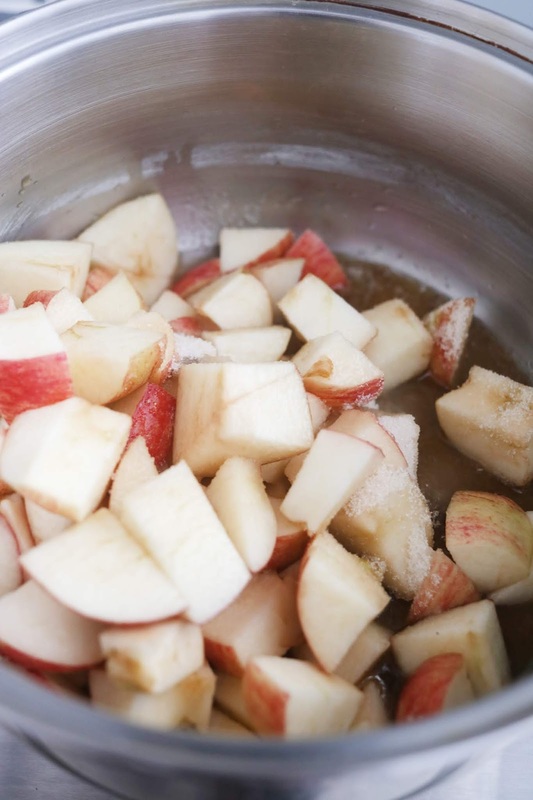 Step 1- Core and chop the apples into squares, set aside. 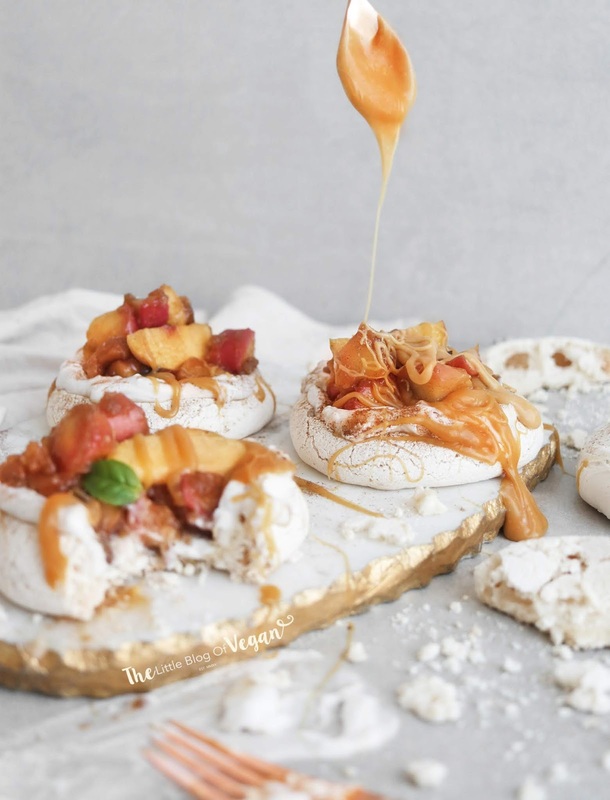 Step 1- Spread some dairy-free cream, or coconut whip over the meringues, pile on some of the apple pie filling, a grilled peach slice (optional), a drizzle of caramel sauce and dust over some ground cinnamon. Serve fresh, day of making. 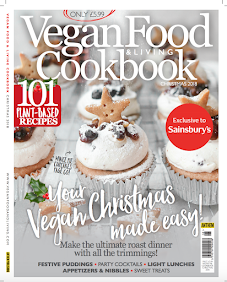 Can be made a day ahead and chilled in the fridge.